ATM manufactures in all sizes listed below. They are an excellent and most economical way to sample RF power from the main line in a rectangular waveguide system. These rectangular waveguide power samplers cover the full waveguide frequency range with standard coupling values of 30db, 40db, and 50db, however other options are available. Power samplers are offered with standard RF connectors including SMA and Type-K on some models. Manufactured in aluminum or copper/brass construction. 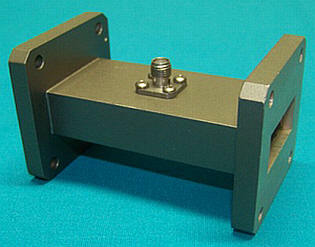 Double ridge waveguide power samplers are also available. Pressure sealed waveguide power samplers are also available for microwave applications that require sealed systems. Multiple flange and coaxial connector types and configurations are also available. For more information please call us to discuss your needs with our design engineers. Coupling: 30, 40, 50 dB standard, others available upon request. General: MIl_DTL-39000, MIL-DTL-3922, AMS-QQ-A-250/11, AMS-QQ-A-225/8, ASTM B209, ASTM B211, ASTM B221, ASTM B152, ASTM B187, ASTM B272, ASTM B16, ASTM B36, ASTM-PRF-39012. Pressure Sealed Units: Add "/PT" to model number. Note: Pressure sealed units will hold 15 psi assuming all waveguide and coax ports are mated and sealed. ** These units are supplied with 2.9 (K-female type) connectors. Option: Add /PT to part number for pressure sealed unit to 15 psi.